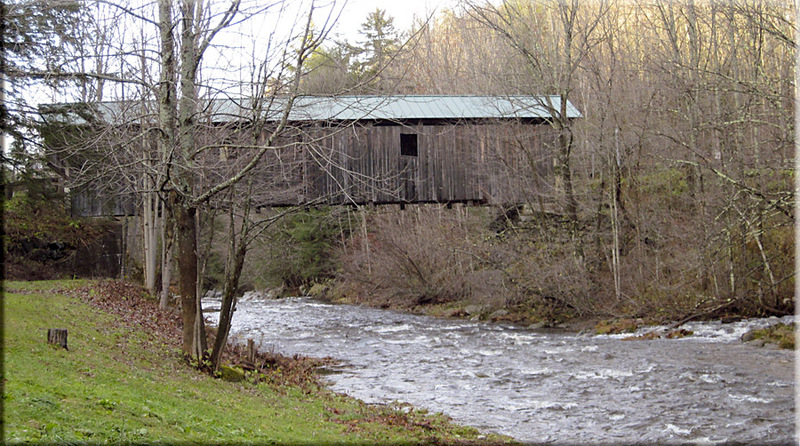 Vermont is famous for its covered bridges. 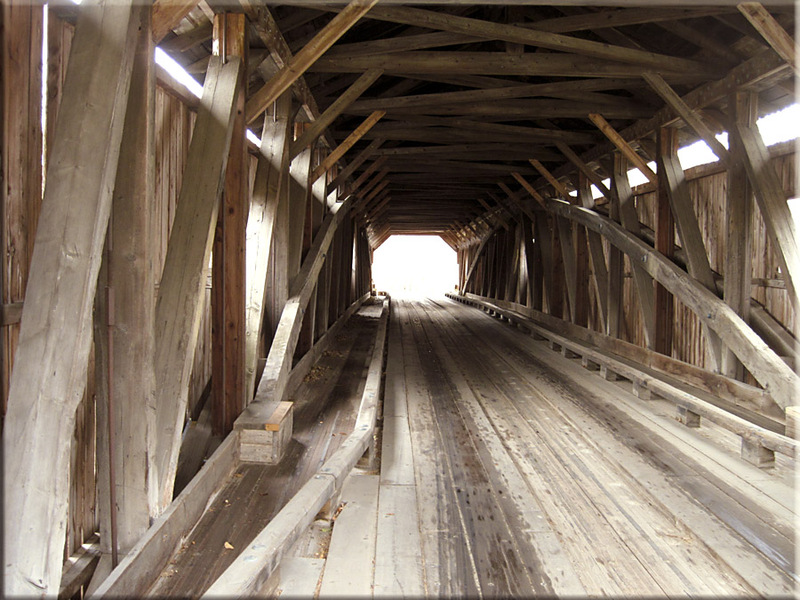 Wooden bridges deteriorate quickly from the sun and moisture, and a load of snow on the bridge makes it heavy and unable to carry its full weight. It was found that bridges with a peaked roof tended to shed snow, and with roof and sides lasted much longer than the ten or fifteen year life-span of an unprotected wooden bridge. 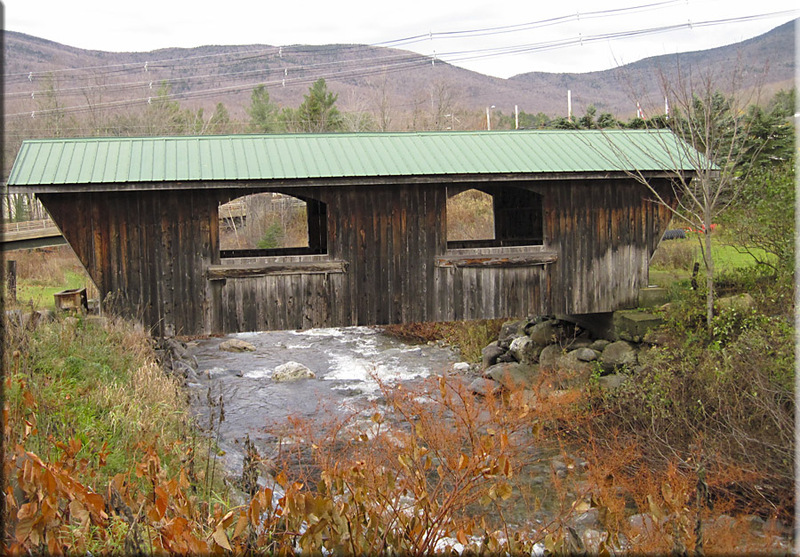 Here are some photos of covered bridges that I found within a ten mile radius of Smuggler's Notch. 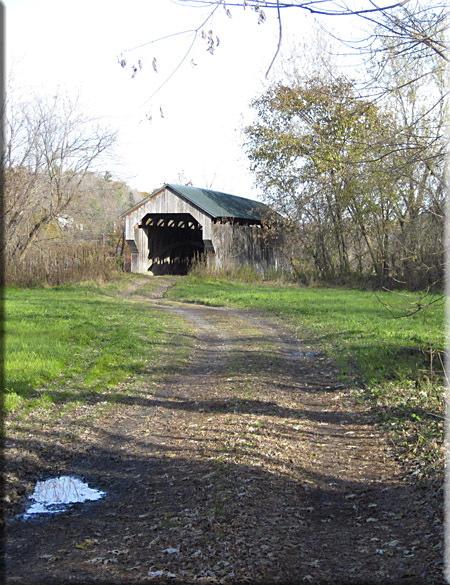 The Cambridge Junction Bridge was one of the longer covered bridges. It passed over the Lamoille River. Inside the Cambridge Junction Bridge. 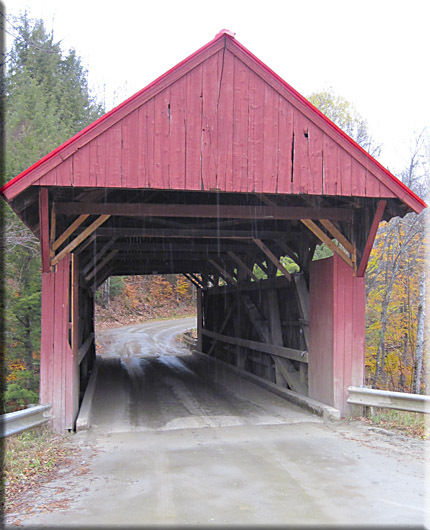 The curved truss is an important load-bearing feature of the covered bridge. The Gates Bridge is a short bridge which now connects a farmer to his field. This log bridge crosses a creek and can be expected to rot away in a decade or so. 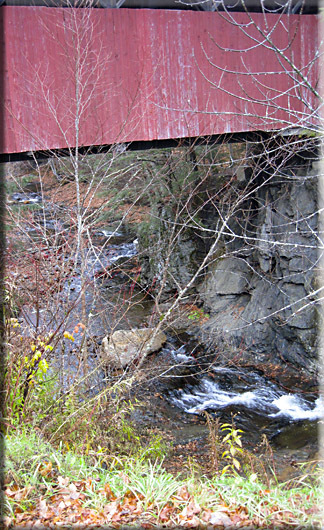 The Red bridge lies a few miles north of Stowe and still carries a good deal of traffic. The tumbling creek below Red Bridge. 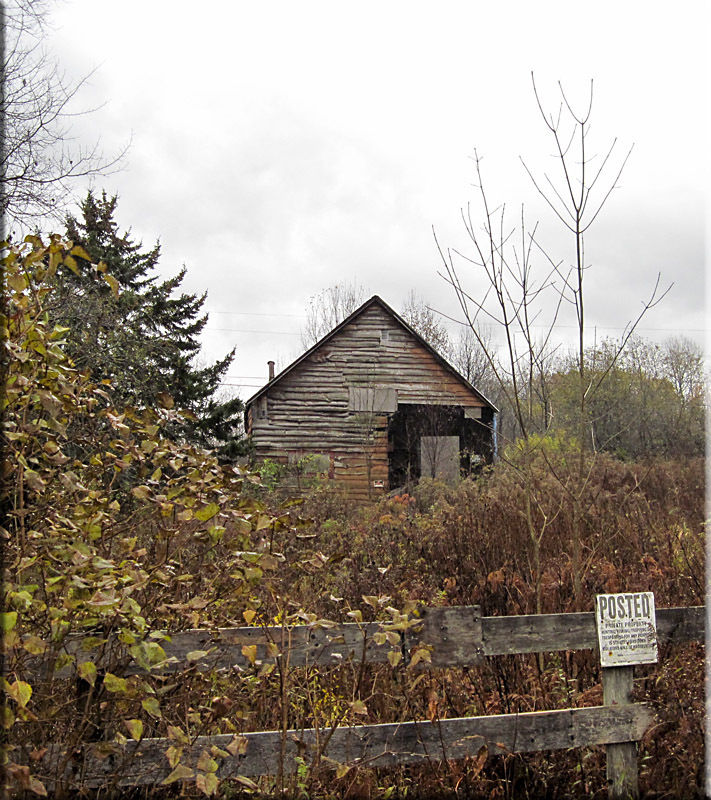 An old log cabin across the road from Red Bridge. The Smuggler's Notch Bridge, across the road from the resort. 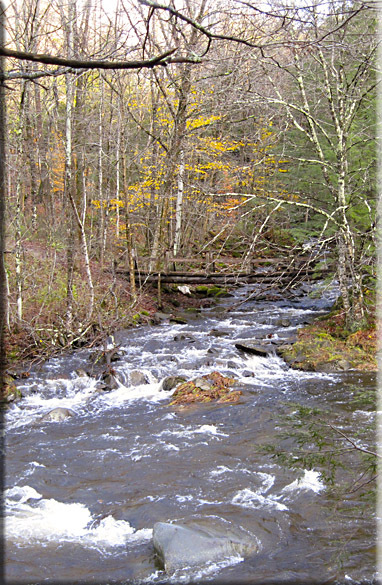 The Brewster River, looking upstream from the Grist Hill Bridge. 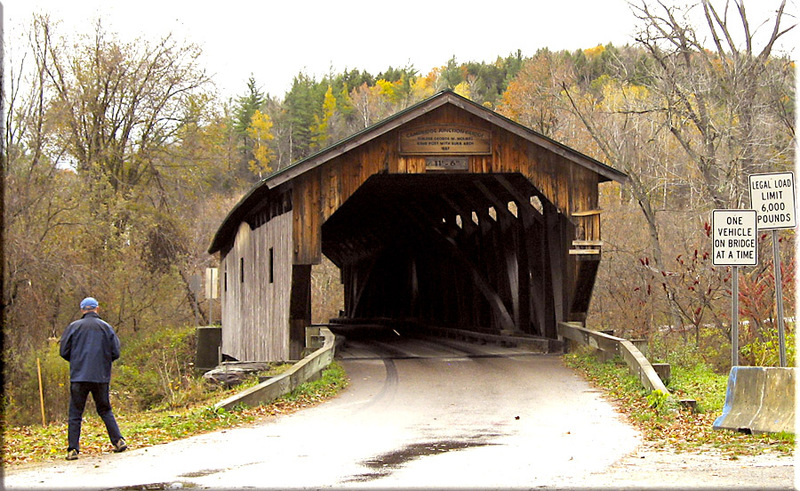 Vermont is full of water in the form of lakes and rivers, however, two lakes in particular have played a significant role in the state's history and transportation. Both lakes are long and narrow, both are oriented north-south, and each of them lies in both Vermont and Canada. They both formed a transportation avenue for fur trappers who would paddle their canoes up and down the lakes to trade for beaver pelts from the Indians. The lakes facilitated trade between the U.S. and Canada. Lake Champlain forms at least half of Vermont's western border with upstate New York. Vermont's largest city, Burlington, lies on Lake Champlain. 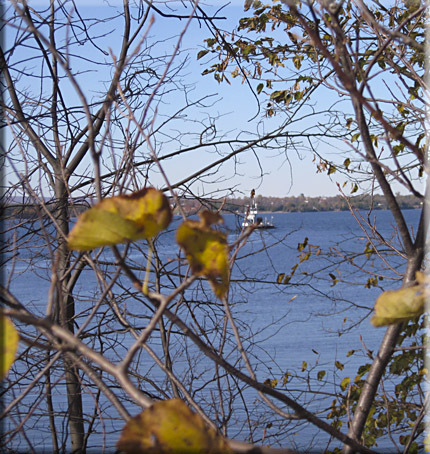 Lake Memphrenagog is perhaps less traveled, but also provides a watery passage well into Canada. 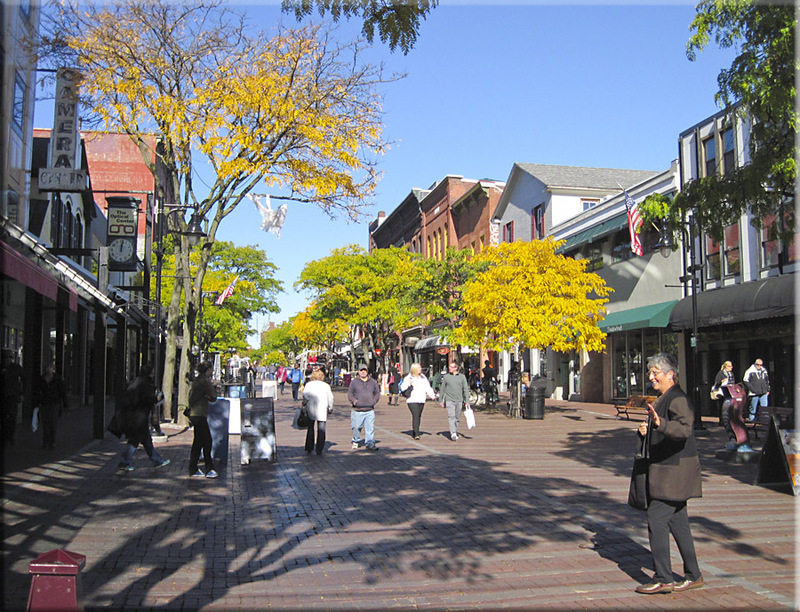 Burlington, a city of 42,000, has three universities. 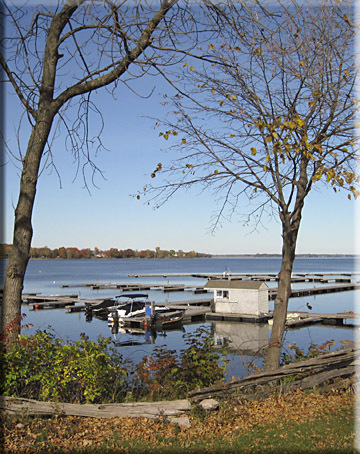 With it's location on the eastern bank of Lake Champlain, Burlington has been a trade hub with Canada as well as a center for exporting lumber, especially hardwood. It is an attractive city, with large parks on the water, as well as the Church Street Marketplace, several traffic-free blocks of down-town shopping. The Church Street Marketplace provides several blocks of downtown shops for browsing, as well as an indoor mall. 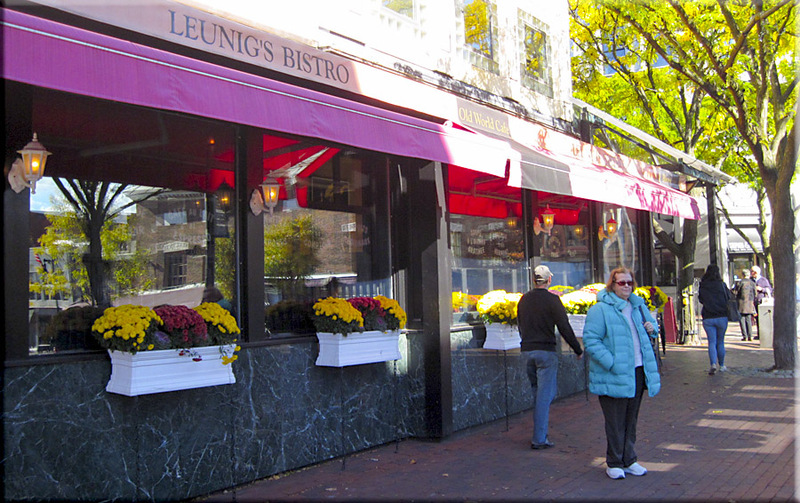 One of many restaurants on Church Street. 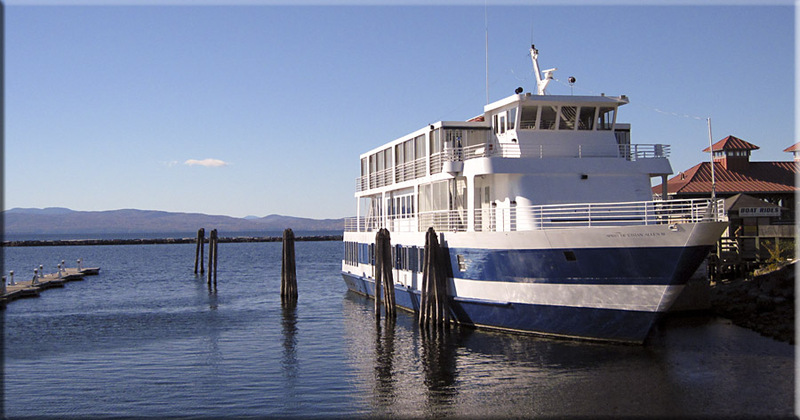 This Burlington tour boat gives rides on Lake Champlain. Nearby is a car ferry which saves several hours of driving to upstate New York. Upstate New York is visible in the background. A chain of islands at the north end of Lake Champlain is connected by highway 2. These lightly populated islands provide flat, rich farmland, as well as scenic access to the water for tourists. 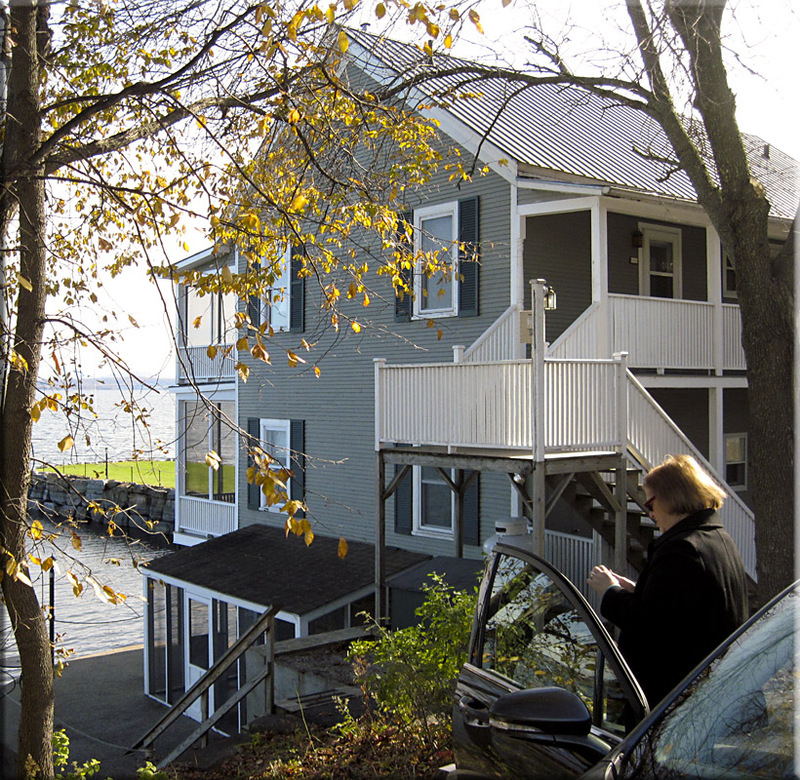 On Grand Isle, near the north end of Lake Champlain, a car ferry travels the short distance to New York. A Marina on Grand Isle would be full of boats in the summer time, but is nearly empty in October. A guest house on North Hero Island. 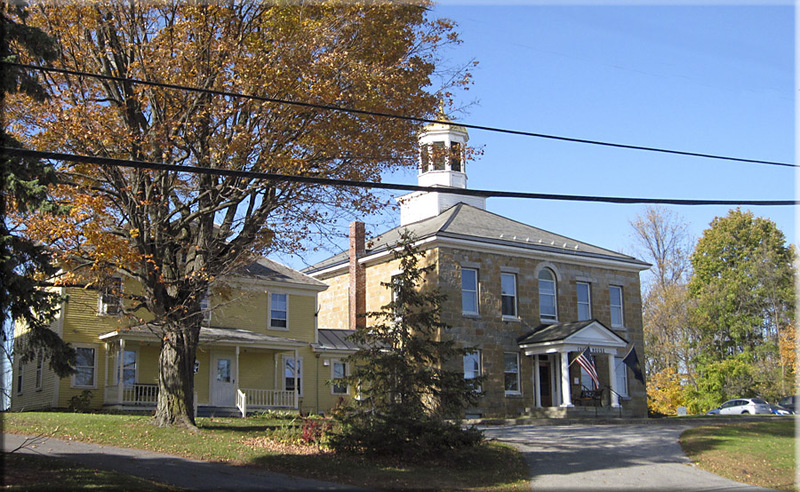 The Grand Isle County Courthouse. 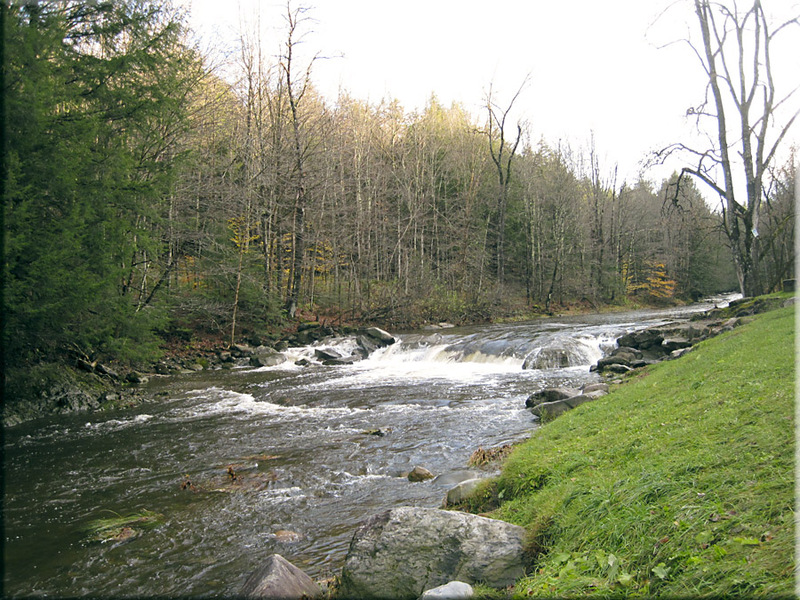 Vermont is a beautiful state, and in one week we only explored a tiny part of it. It has done better than most states at preserving its cultural heritage and and protecting its natural beauty from the ravages that tend to accompany progress. 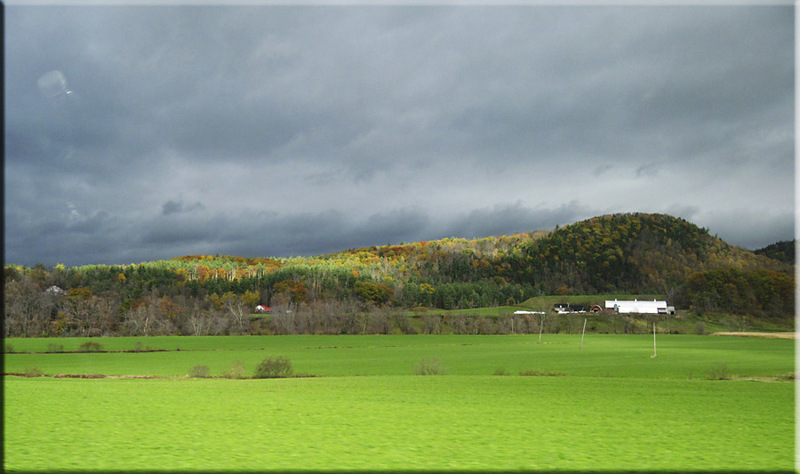 I hope that you have enjoyed this brief tour of northern Vermont. A storm over the Green Mountains.